1. For the potatoes: Heat the oven to 160°C, gas mark 2-3. Heat a heavy-based frying pan over a medium heat and add a good drizzle of olive oil. Add the onion, leek, fennel and garlic with the fennel seeds and half of the thyme leaves. Sweat for 3-4 minutes, stirring occasionally. 2. Meanwhile, bring the stock to the boil in a saucepan and add the rest of the thyme leaves. Liberally grease a shallow baking dish with a little of the butter. 3. Slice the potatoes thinly, using a mandoline (if you have one) or a very sharp knife. Layer the potato slices in the baking dish, overlapping them and alternating the layers with the onion and fennel mixture. Season in between the layers with salt and pepper. Finish with a neat overlapping layer of potato slices. 4. Pour over the hot stock and dot with the remaining butter. Cover the dish with foil and bake for 1 hour. Remove the foil and cook for another 30 minutes or until the top is crisp and golden and the potatoes are cooked through. Leave to stand for a few minutes before serving. 5. For the lamb: Heat the oven to 200°C, gas mark 6. Lightly score the fat covering the lamb and rub with salt and pepper. Heat a splash of olive oil in a cast-iron casserole dish (with a lid) over a medium heat. Add the rack of lamb and brown well all over for 6-8 minutes. Remove the lamb from the casserole dish and set aside. 7. Lift the lamb from the hay or rack onto a warm platter and leave to rest in a warm place for 5-10 minutes. 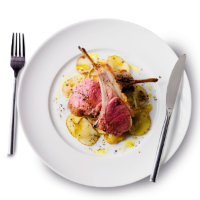 Carve the lamb and serve with the boulangère potatoes and French beans or another green vegetable. Weekend Kitchen With Waitrose is a live show. All recipes are therefore subject to change.